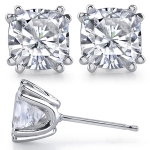 Cushion Cut Charles & Colvard Moissanite 8 prong Stud Earrings. Very nice setting. Available in 14k White or 14k Yellow Gold! Our newest and most popular style of earrings!